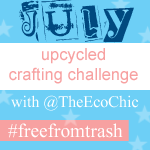 Eco-confession: Sometime we forget our reusable shopping bags! Eeeks! When we can’t carry everything we purchased out of the store without bags we do on occasion have to resort to plastic shopping bags. It’s rare that it happens but sometimes we end up with a few plastic bags in the house. Most of the time my husband re-purposes the bags for lunch totes (he looses real bags) and sometimes we donate them to the day care (they use a ton of plastic bags to send home dirty, wet, and soiled clothes). I decided to turn them into a fashionable clutch and plan on taking it to a conference with me later this summer. It’s just the right size to hold my business cards, my room key, and a small wallet with my ID and credit card. Cut the seam and handles off of the plastic bags. Place 6-8 layers of plastic bags on top of each other. Put a piece of parchment paper on top and bottom of the stack of bags. Iron for about 2-3 minutes (on Rayon setting), flip and iron the reverse side 2-3 minutes. The bags should begin to fuse together. Pay special attention to the edges. *Iron next to an open window or door to provide ventilation. I didn’t experience any smells or fumes from the plastic but it is possible. Once pieces are properly fused together and cooled, cut to desired size. For this project I sized the pieces 5″ X 9″. 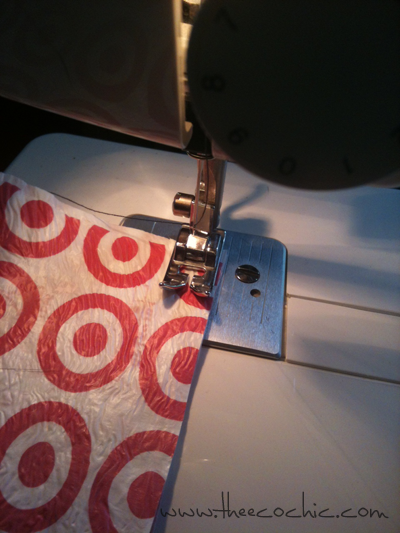 Sew pieces together on 3 sides, trim the edges and corners, and flip to the right side. 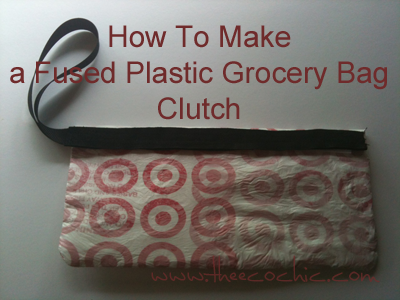 Attach the wristlet (from ribbon) on the top flap. Finish the flap by attaching a coordinating ribbon and add Velcro or snap closure. Wow, I’m so excited with how this turned out! I think I may make a few more. 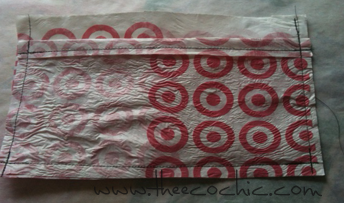 What do you do with your plastic grocery bags (when you forget to take your reusable one’s of course)? OMG! adorable! I posted the same use for the bags on my challenge post today but I didn’t have the energy to actually do it. Your clutch is really awesome and you should consider selling them. There are very few upcycled plastic bags items on Etsy and I think these would be a hit. Or sell them for a fundraiser for your favorite charity or organization!! !